During the 1920s and ‘30s, a little old lady walked the halls of the Biltmore and the Alexandria, the two grandest hotels downtown L.A. had to offer. Dressed in black, she was easy to miss, a seemingly bygone holdover from the Victorian era, insignificant amid the swirl of modern life. But what most of the flappers and philosophers who brushed past her didn’t know was that they were passing former royalty. She was none other than Emma Summers, “the Oil Queen of California,” whose financial brilliance had made her millions at the turn of the century, outwitting big oil companies and controlling the L.A. market for over a decade. Emma A. McCutchen was born in Kentucky in 1858, the privileged daughter of a banker who was also involved in politics. A naturally gifted pianist, Emma graduated from the prestigious New England Conservatory of Music in Boston in 1879. She soon married a man named Alpha C. Summers, and the couple headed west, living briefly in Texas before making their way to boomtown Los Angeles. 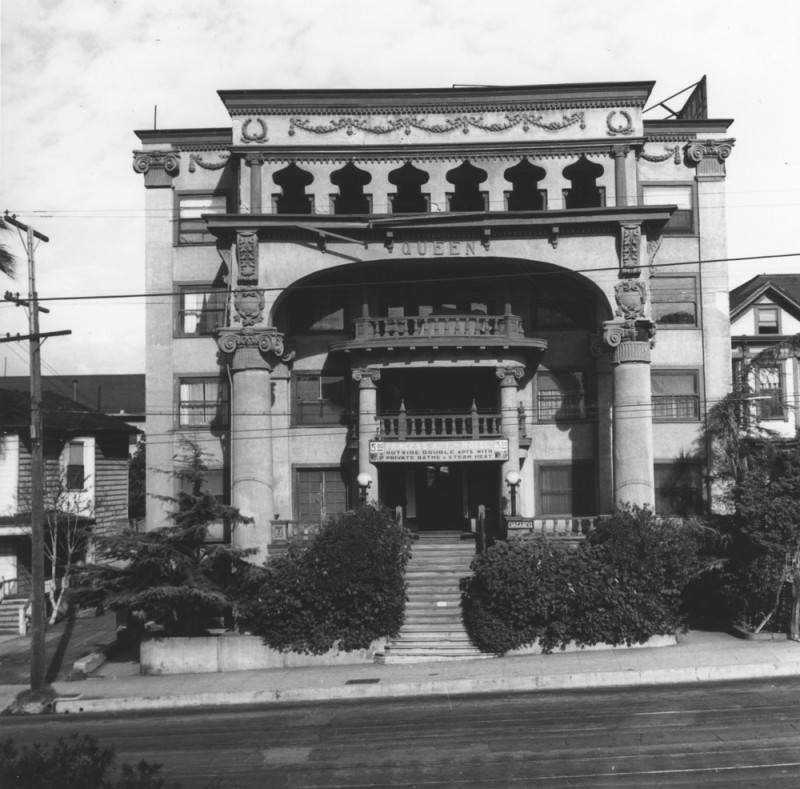 In 1883, the Summers moved into a home on California Street on Fort Moore Hill, then a wealthy neighborhood that shared space with the City Cemetery and later the Los Angeles Public High School. The deeply religious Emma became a popular piano teacher, hosting pupils in her Fort Moore Hill home. But Emma craved more and soon began using her earnings to dabble in the ever-expanding SoCal real estate market. This market was forever changed in 1892, when E.L. Doheny and Charles A. Canfield discovered oil in the upscale neighborhood of Crown Hill, just west of downtown L.A.
Emma was fascinated by the discovery and subsequent oil frenzy, and soon paid $700 for a half interest in a well at Court and Temple streets. It was a bumpy entry into the business- the casing of the well collapsed, and more and more money was needed to continue the operation. Despite her prim-and-proper appearance, Emma relished being in the field among the other wildcatters. “Night after night, by the light of a flaring torch, she hovered over it, as if it were a sick babe’s cradle,” one associate recalled. Her persistence finally paid off when the oil came in. Encouraged and obsessed, Emma went into debt buying up more wells on Crown Hill. “When I found myself $10,000 in debt, I thought if I ever got that paid and as much more in the bank, I would be glad to quit,” she later recalled. But this was not to be, as the seed had been planted. “I saw a chance in the oil business and sunk a well, and that carried me on and on until I couldn’t stop,” she admitted. 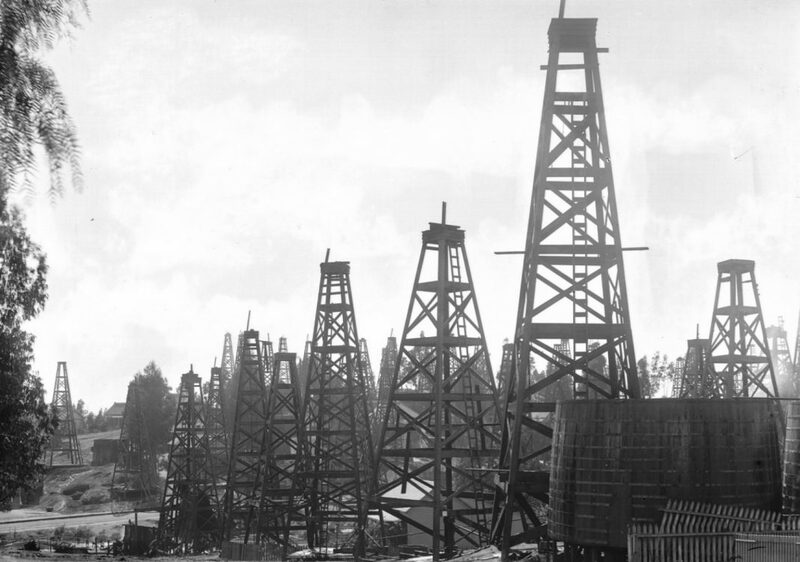 The elegant Mrs. Summers soon became a fixture on the Los Angeles Oil Field, as the expansive oil district around the original Doheny well came to be called. According to Rasmussen, Emma soon taught herself the laws of supply and demand and began selling oil to major consumers all over town, cutting out any middlemen and taking no partners. By the turn of the century, the “shadow of the little lady in black” loomed large in California business circles. “If Mrs. Emma A. Summers were less than a genius she could not, as she does today, control the Los Angeles oil markets,” the San Francisco Call reported in 1901. But this congeniality belied a shrewd business sense and a character made of steel. “There are men in Los Angeles who not like Emma Summers,” Sunset Magazine reported. “But that is merely because she has followed the golden rule of business and done unto other as they would have done to her—and done it first. If anyone thinks the “oil queen” has been dethroned in Los Angeles, it is a guess very wide of the mark. If Mrs. Emma A. Summers was ever entitled to be called the “California Oil Queen,” the title is hers today. She has defied, once more, the giants of the local field, has won the fight and she is today said to be in absolute and triumphant control. Bite your lips, if you must, you “big fellows,” at being defeated by this nervy little woman, but take your medicine, for everybody else will enjoy the joke. 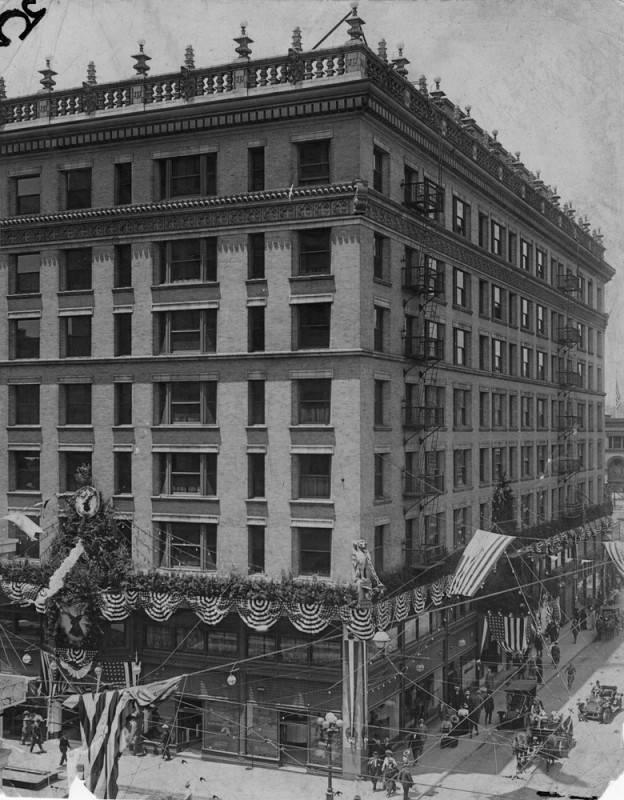 But Emma was not satisfied to just be the Oil Queen of Los Angeles, conducting business out of the grand new Hellman Building at 4th and Spring Streets. She soon branched out into other areas, buying oil wells in Kansas and backing early downtown theaters like the Casino and the Broadway. In news reports from the time, she was credited with single-handedly saving the Broadway. Mrs. E.A. Summers, the Los Angeles “oil queen” was a queen indeed yesterday. At a wave of her wand, her competitors bowed at her feet as she deftly snatched from their grasp two large contracts. Even the Standard Oil Company did her homage, for she underbid them on a big order. No royal personage of olden times ever ruled subjects as the clever woman who reigns in the local oil jobbing industry ruled the situation when the bids were opened for supplying the county and city with the product of the wells. Revenge!” I echoed, for I could not see how a woman with a reputed income of $25,000 a year could find it in her heart to be revenged on anything. The Queen’s amazing success often led her into lawsuits with oil companies including Union Oil, business partners, and once—for complex financial reasons—herself. Whether accused of graft or keeping unclean horses, Emma always appeared in court and usually came out on top. She was fiercely protective of those who worked for her, defending her foreman and her chauffeur when they were accused of assaults. Ansel Adam took this photo of Emma Summers’ former home, when it was an apartment building. It was demolished to make way for the 101 Freeway. Her success grew during the lead-up to World War I, as America’s consumption of fuel rose rapidly. Not all business all the time, Emma lived large on her own time too. She loved motoring, buying an elegant sixty-horse power Thomas Flyer. At her opulent mansion in Westlake (where Bullocks-Wilshire was later built), she had an impressive art collection, which included works by De Longpre and Corot. She owned ranches, and for a time, the Redondo Hotel. It seems Emma lived too large, and in 1919, her $60,000 prized art collection was seized to pay off a court judgment against her. Her wells became less and less profitable, and she was forced to return to her old domain at Fort Moore Hill. She quickly turned this home into a hotel named “The Queen,” while she moved to the Biltmore and Alexandria Hotels. She died on Nov. 27, 1941, at Windsor Hospital in Glendale. All hail the Queen. RELATED: 4 Oil Wells Hidden in Plain Sight in L.A.